Man, the only thing I regret about these 5 Ingredient Vegan Butterfingers is that I make them sooner! Peanut butter, chocolate, and dates? Count me in. What gives these Vegan Butterfingers their crunch is the surprise addition of corn flakes! My first batch I blended them in the food processor with the other ingredients, but that cut down on their crunchiness. So I now recommend crushing them separately and stirring them into the peanut butter mixture for maximum crunch! Make your own all-natural Butterfinger candy bars with only 5 ingredients. They're sweet, salty, super chocolatey, and incredibly easy to make. Soften the dates in a bowl of hot water for 5 minutes. Meanwhile, crush the corn flakes in a medium sized bowl. Set aside 1/2 cup of corn flakes for garnish. Drain the dates and add them to a food processor along with the peanut butter and maple syrup. Process until smooth then transfer to the bowl of corn flakes. Fold the peanut butter mixture into the corn flakes and stir until even. Pour the mixture into a loaf tin lined with parchment paper. Use a spatula to level off the top. Freeze for four hours or overnight. When the peanut butter bars are firm, remove them from the tin and cut them into bars. This recipe makes either 8 large candy bars or 16 mini bars. Melt the chocolate chips in a small sauce pan. Add a few tablespoons of coconut oil or non-dairy milk to thin in out, if desired. Carefully coat each candy bar in chocolate and top with sprinkled corn flake pieces. Freeze again for 30 minutes. Best served right out of the freezer. Be sure you have plenty of people to share these Vegan Butterfingers with! Or you may find yourself standing outside your freezer like a crazy person shoveling them into your mouth. Or is that just me? 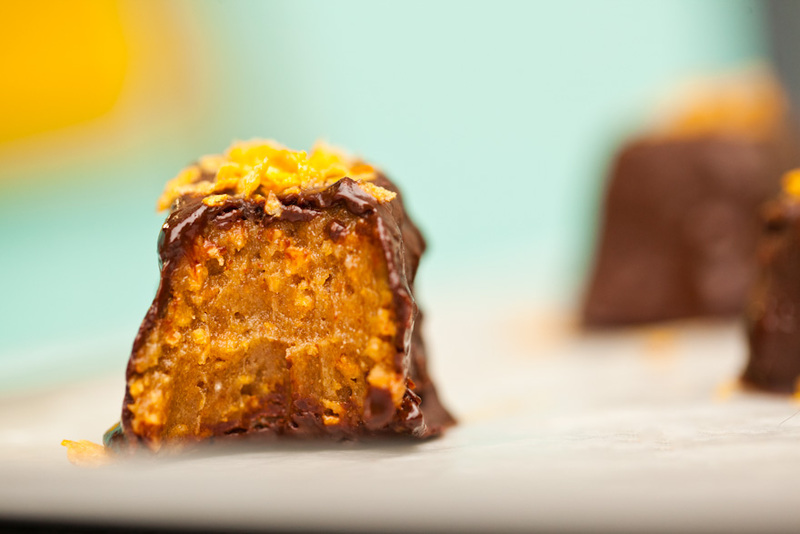 If you make these Vegan Butterfingers, be a pal and leave us a comment below! We love hearing about your kitchen adventures. For bonus points, snap a photo to Instagram with the #carrotsandflowers 🙂 To save this recipe for later, pin the photo below! If you enjoyed this recipe, check out out Vegan Rocky Road Cookies. They are TO DIE FOR, I swear! If chocolate and peanut butter is your thang, we also make a killer Chocolate Peanut Butter Pie. To never miss a recipe, be sure to follow us on social media! We love interacting with you all on Facebook, Instagram, Pinterest, and Twitter. Hey Megan, these look great! I’m going to give it a try. What texture should the mixture after being processed in the food processor? At first it was dry-ish/crumbly, then I added 5 more dates which made it chewier. Your directions say to pour the mixture into the tin but I’m not getting anything near a pourable consistency. Wish the video showed it! Help! Thanks! Just made these. Tasty. I followed video rather than directions so failed to soften dates. Oops. I simply added 2 T warm water to food processor. Also used 10-oz bag of Enjoy Life vegan choc chips…recipe calls for 12 oz. I had plenty of chocolate, & i even cut the bars in half, meaning more surface area to cover. So after freezing i drizzled on another coating of chocolate. These are rich. Cutting bars in half is the way to go. Still, my husband & i split those! This recipe is incredible – I can’t believe how yummy it is with only 5 ingredients! I brought these to a party so I doubled the recipe and rolled them into balls before coating with chocolate. I’m definitely making these again. Hey, I just wondered how long these keep for generally? and out of the fridge or in the fridge. My husband LOVES them.